Happy Chocolate Pudding Day!!! 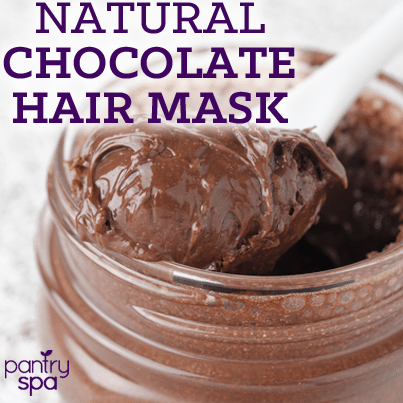 In celebration of this delicious day, everyone should make this yummy Chocolate Pudding Hair Mask. This deep conditioner is amazing for dry hair. If you have oily hair, definitely put on the ends of your hair and avoid the roots and the area near them. 1. Melt the chocolate in a double boiler, or in the microwave (stirring and checking often to make sure not to over heat). 2. Combine the yogurt, chocolate and honey… it will be a similar to a chocolate pudding type of texture if you use a Greek Yogurt. 3. While the mask is warm (but not hot enough to burn you), distribute it throughout your hair (but staying away from your scalp, especially if you have oily hair). 4. Wrap your hair in saran wrap. 5. After an hour, or as long as you like, remove the mask with your fingers directly into a garbage can (to prevent clogging your drain). 6. Shampoo and condition your hair as usual. If we want to use cocoa powder than what should be the quantity.